The Riverside trail is a short walk around Ixworth and the surrounding countryside. From the Village Hall car park turn left down the High Street to the village sign. This is the site of the original market granted by Richard II in 1384. There are 4 medieval houses; Ridgetile House on your left (late 14th century); Dover Farm (16th century) named after a Mary Dover who occupied in the mid 1800s; Holmlea (16th century) and Cyder House (15th century). Turn left along Stow Road and before the roundabout, cross to follow the path through the trees along the bank. This takes you under the A143 flyover to the riverside. Through the kissing gate follow the well walked path, following the roadside fence until the river bend after which you continue beside the river. Turn left at the next fence to leave the riverside via a gate. Carefully cross the road to the field opposite where you turn right and to walk along the edge of a field to safely recross the road at the old pumping station. 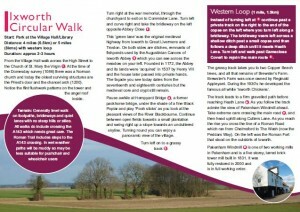 Follow Baileypool Lane, over Baileypool Bridge to the junction with Mill Road where you join the Ixworth Circular Walk . 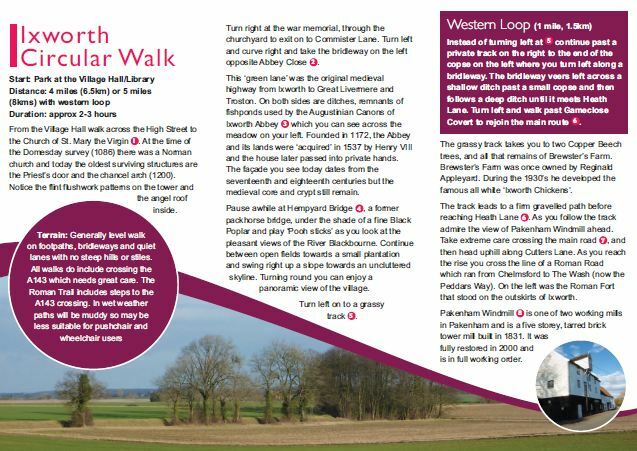 TO DOWNLOAD THE FULL BROCHURE PRODUCED BY SUFFOLK COUNTY COUNCIL ON THE CIRCULAR WALKS AROUND IXWORTH PLEASE CLICK HERE.